startElement() : Every time a SAX parser gets a opening tag '<', it calls startElement() and process the xml according to the code written in startElement(). endElement(): Every time a SAX parser gets a closing tag '>', it calls endElement() and process the xml according to the code written in endElement(). character(): Every time a SAX parser gets a simple character string, it calls character() method and the xml according to the code written in startElement(). The three methods explained above are responsible to parse the xml in SAX parser, developer use the methods as events and can write parsing and extraction code accordingly. In today's discussion we will come across a sample project to simplify 'how to read an xml in java using sax parser' and 'how to use sax for xml parsing'. Here is the overall project structure for today's discussion, 'xmlToRead' folder contains xml that we are going to read and display the output on console. 'ReadXml.java ' contains the parsing code in java to read xml using sax. Here is the sample xml document that we are going to parse and write the content on console. This is a simple implementation class to see the things working. This is the output that we will get on console after reading the specified xml file. 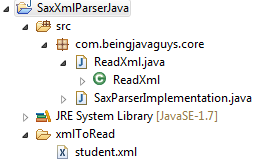 In this particular blog we cam across 'How to read xml in java using sax parser' and 'how to use sax for xml parsing'. In upcoming blogs we will come across more about more xml parser in java and their implementation. Read more about XML & JSON under DOM & JDOM2 & XML parser in Java JSON, and JAXB - Marshalling & Unmarshalling in Java categories.